Hello and welcome back to my blog! 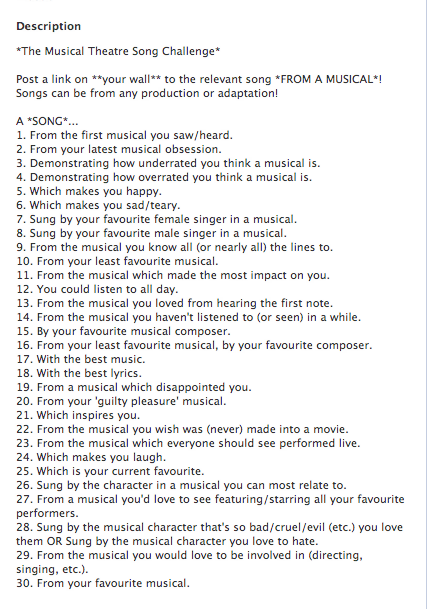 As tonight is the Tony Awards, today I’ll be doing The Musical Theatre Song Challenge. I absolutely love musicals and I’ve written a few musical related posts on my blog like every show/musical/concert I’ve ever seen. I’ve seen a fair few musicals so I should have a wide range of choices for this however, I am currently listening to the Mean Girls cast recording so there could be a high possibility that I use only Mean Girls songs but I’ll try my best! I’ll be including songs from soundtracks I love even if I haven’t seen the musical (Hamilton, Mean Girls, Dear Evan Hansen etc.). From the first musical you saw/heard. This is my favourite version of this song and I’ve heard a few as I’ve seen the show live at least 4 times and I have the cast recording with Jason Donovan. Alongside this version by Donny Osmond though, I really loved Joe McElderry’s performance when I saw him last year! From your latest musical obsession. This is one of my favourite songs from the musical! I love how each of the plastics (and every character, actually) has their own style of music. Damien is sort of classic Broadway show tunes, Janis is more rock, Cady’s songs sound like they’re from Disney etc. It’s such a clever way of doing it! Demonstrating how underrated you think a musical is. I can’t speak for the stage show but I think the film is incredibly underrated. The cast is phenomenal (Meryl Streep, Anna Kendrick, Emily Blunt, James Corden, Christine Baranski, Chris Pine, the list goes on!). It’s such a clever film that intertwines so many fairytale characters and some of the songs are fabulous and one of my favourites is Last Midnight. Demonstrating how overrated you think a musical is. This particular performance of Let It Go from the new Frozen musical. It’s just so magical it makes me cry I’m dying to see it live! This song comes after the death of Eliza and Alexander’s son, Philip. I think it’s a really beautiful song and really makes you think about how it would feel to lose a child. For some reason, I couldn’t find the original Broadway cast recording of this song (or any song, really) so here’s the cover by Kelly Clarkson who does a beautiful job but if you can, please listen to the original because it’s incredible as is the entire soundtrack. Sung by your favourite female musical singer in a musical. I’ve never seen Idina Menzel live in concert or in a musical but it is something on my bucket list because I just think she’s incredible and this song is epic. Sung by your favourite male singer in a musical. This was a tricky one for me but I’ve decided to go with Leslie Odom Jr. singing The Room Where It Happens from Hamilton. Again, I couldn’t get a recording from the show but this is pretty close I just think it’s a bit more sped up and there are other characters that have some lines in the song so Leslie sings all the parts in this version. From the musical you know all (or nearly all) the lines to. If you sit down and watch the film of Mamma Mia with me you can guarantee you will be annoyed after the first 10 minutes because I know ALL OF THE WORDS and not just to the songs, the dialogue too! This is my favourite song from the film and I don’t care if you think Pierce Brosnan is rubbish because I love him in this! From your least favourite musical. This was another tricky one for me because there are a few musicals I didn’t like which are really popular like Rent and Les Miserables… please don’t hate me! I decided to go with this one from The Producers because I saw it live whereas I’ve only seen the films of Rent and Les Mis and I wasn’t really a fan, I found it incredibly boring but I do really like this song! Fun fact, the singers in this song, Nathan Lane and Matthew Broderick playes Timon and Simba in the Lion King film!! From the musical which made the most impact on you. There hasn’t really been a musical that’s had an impact on me but this song really means a lot to me because it’s just so inspiring! I haven’t seen the musical but I really hope to see it one day. You could listen to all day. I don’t know if I have a show I could listen to all day because I get really fed up of hearing the same thing over and over again but I think I’d have to pick Hamilton because the soundtrack is literally the show and it’s about 2 and a half hours long so you would listen to it fewer times because it’s so long as opposed to a 30 minute soundtrack like The Sound of Music if that makes sense? When I started this tag I wanted to try and have one song per musical but I think this is the 3rd Hamilton song I’m adding but I’m not sorry because it’s incredible. From the musical you loved from hearing the first note. I saw the arena tour of Jesus Christ Superstar back in 2012 (I think) and it was phenomenal. It’s hands down one of the best shows I’ve ever seen and this is one of my favourite songs. From the musical you haven’t listened to (or seen) in a while. Okay so this isn’t your traditional musical but I’ve seen it on stage so it counts! I’m actually watching HSM 3 as I’m writing this but I haven’t seen or listened to the first one for years. I just can’t since finding out Zac doesn’t sing in it! Bop To The Top is one of my absolute faves which is why I’ve picked it! By your favourite musical composer. I think my favourite musical composer is Andrew Lloyd Webber and I chose this song out of the (probably) hundreds of songs composed by ALW because I love that it’s sung by (insanely talented) children and it’s quite a sad song and I just find it to be quite relatable. From your least favourite musical, by your favourite composer. I’ve only seen the film of this musical and I wasn’t a fan. I did have tickets to the show for Christmas a few years back but I was too ill to go and I have heard that the stage musical is far better than the film so maybe my opinion would change if I saw it live. There are some fabulous songs in the musical and my favourite is the title song. I spent a long time thinking about this one and then it hit me. We Will Rock You. Something not many people know about me is I absolutely ADORE Queen. I wish I could have had the chance to see them in concert before Freddie died but unfortunately I was born a few years too late. My dad took my and my brother to see We Will Rock You on the West End in about 2010 I think and I loved it. This is one of my favourite songs from the show and by Queen and it’s sung by the phenomenal Kerry Ellis. Okay, so the lyrics in this song are just so empowering and inspiring and not just in this song, every song in the film is incredible and I can’t wait for the day this film becomes a stage show! From a musical which disappointed you. I saw Barnum about 6 years ago now maybe and I really didn’t enjoy it. My mam and grandparents had been to see it twice I think years ago when Michael Crawford played the lead role on the west end and they kept on saying how incredible it was. The production I saw starred Brian Conley and I was so disappointed because I’d been told how incredible the show is. From your ‘guilty pleasure’ musical. something, such as a film, television programme, or piece of music, that one enjoys despite feeling that it is not generally held in high regard. I also googled guilty pleasure musicals and there are some incredible musicals on the list that I adore like Grease, Hairspray and Annie along with some mega-popular ones like Wicked and Les Mis so I don’t really understand it! Another one on the list is Legally Blonde which is one of my favourites EVER so that’s why I picked a song from that musical. I absolutely adore Annie and this song is one of my favourites. It just reminds me that tomorrow is a new day and it can always get better. From the musical you wish was (never) made into a movie. This is probably extremely controversial but I wish West Side Story was never made into a movie. I saw a local school do a production of West Side Story a few years back and I loved it, it was absolutely incredible. Then, I watched the film and I was completely bored and underwhelmed with it. It was far better on the stage, I have no idea why but for me, it was. However, I do love this song SO MUCH!!! From the musical which everyone should see performed live. I know I’ve already mentioned JCS in this post but I can’t think of anything else for this one. I mentioned I saw the arena tour a few years ago and I completely fell in love with the show. I can’s speak for other productions done in a theatre but the arena show was such a spectacle. You can actually buy the DVD on Amazon so I’d definitely recommend it! Singin In The Rain is one of my favourite musicals. I first heard/saw this song on Glee and since then I’ve seen the film and a stage production of the show and I just adore it. I know Gene Kelly is the star of this film and he’s incredible but Donald O’Connor is so underrated, his physical comedy is just brilliant! Which is your current favourite? This one was a tossup between Mean Girls and Hamilton but as it’s easier to get a hold of the songs from Mean Girls, I’ve picked this one. My absolute favourite song from the show is World Burn. It’s sung by Regina when she’s writing in the burn book and then takes it to the principal. Taylor Louderman who plays Regina is such a powerhouse and this song is just incredible! Also, I dare you to find a better villain/revenge song! Sung by the character in a musical you can most relate to. I don’t know if I’ve ever related to a character in a musical. There are a few who have had qualities I’ve admired but there’s nobody I’ve related to. From a musical you’d love to see featuring/starring all your favourite performers. Sung by the musical character that’s so bad/cruel/evil etc. you love them OR sung by the musical character you love to hate. I saw Thoroughly Modern Millie last year and I absolutely loved the character of Mrs Meers who was played by Lucas Rush who was incredible! Mrs Meers is the owner of the hotel Millie lives in with other girls who come to New York and she poisons and kidnaps girls who don’t have families or friends who would come looking for her. She pretends to be a Chinese lady but she’s actually American and this song is her only song in the show (if I’m not mistaken). This is Harriet Harris and the original Broadway cast. Millie played by Sutton Foster who also plays Fiona in the Shrek video I showed! From the musical you would love to be involved in (directing, singing etc). Honestly, I don’t think there’s a musical I would love to be involved with because I just adore watching them. I’m nowhere near talented enough to be able to do anything involving a show except maybe the tour manager (if that’s what they’re even called!). I’ve seen so many touring shows and when I’ve been looking at the dates they’re up and down the country which just doesn’t make any sense to me. Looking at a map, you’d do something like Cardiff, Bristol, Swindon, Oxford, Milton Keynes etc. Not Cardiff, Glasgow, Birmingham, Newcastle, Bristol. It just doesn’t make sense to me at all! This is so hard. I love almost all of the musicals I’ve included in this list and I have so many favourites like Hamilton (as you’ve probably guessed), Mamma Mia, Legally Blonde, Superstar, Joseph but for this one I’ve chosen I show I think is extremely underrated and it’s Singin In The Rain. Aw these musicals are so good! Musicals are one of the only things that can pick me up from feeling down ahaha. What a good challenge!